Here are a dozen succulent garden design essentials for you to keep in mind as you design and plant your own garden. 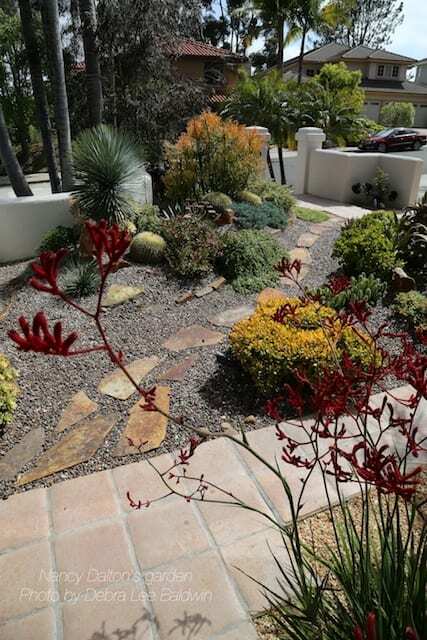 They’re exemplified by an award-winning succulent garden in San Diego, an outstanding example of smart landscaping for Southern California’s arid climate. Many thanks to Nancy Dalton for sharing her garden. Repeat colors and forms. By combining agaves with yuccas, the designers used similar-but-different plants to create continuity. The Yucca rostrata at far right repeats the dark green starburst shapes of slender-leaved agaves at middle left. These in turn echo an intriguing aspect of each other: white filaments that curl from leaf margins. 2. Incorporate textural plants. Texture is both what’s seen up-close, like fuzzy red kangaroo paw flowers, and what’s viewed from a distance, like the mounding jade at middle right and ‘Sticks on Fire’ beyond. Also highly textual are barrel cacti and any plant that shimmers in the breeze—like the Yucca rostrata at left. 3. Sculpt the terrain with berms and valleys. Mounded soil is more interesting than flat and height enhances drainage. Tip: Bring in several yards of topsoil amended with pumice and mound it atop your former lawn or a difficult-to-dig area of compacted dirt. The succulents you plant in fresh soil will quickly take root and thrive. 4. Group plants with varying heights and sizes. In Nancy’s garden, Euphorbia tirucalli ‘Sticks on Fire’ serves as a backdrop for medium-sized succulents such as barrel cacti and variegated elephant’s food (Portulacaria afra ‘Variegata’). Low-growing blue Senecio mandraliscae and Othonna capensis complete the high-medium-low vignette. 6. Grow rangy non-succulents in pots. 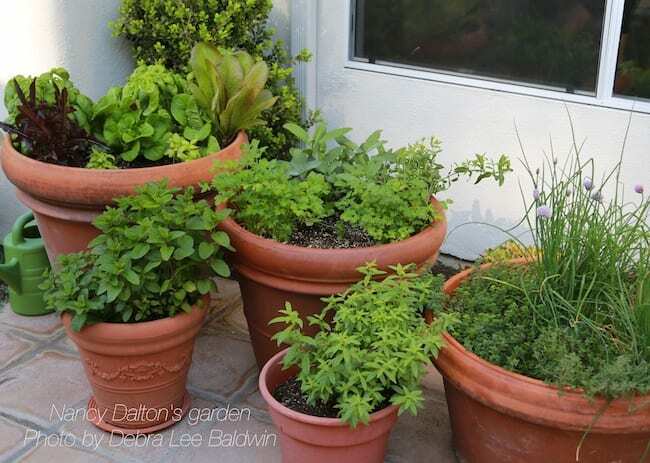 Instead of in the ground, Nancy’s herb garden occupies large terracotta pots near her kitchen door. This keeps the plants under control (some, like mints, are invasive) and makes them easy to water, tend, harvest, and replant. 7. Add a fountain. The sound of splashing water on a patio or adjacent to a garden sitting area blankets neighboring noise and enhances even a small yard’s sense of privacy. It also attracts songbirds. 8. Put complementary colors to work. Succulents come in all colors, as do glazed ceramic pots, so have fun with them! Here, Nancy contrasted blue and orange. Coppertone stonecrop (Sedum nussbaumerianum) in the bed serves as a ground cover, frames the focal point, and flows around pots of Kalanchoe orgyalis (copper spoons) at left and Agave colorata. 9. Display dynamic succulents against walls. Nancy lent interest to a white stucco retaining wall with three brightly-glazed pots. They contain a tall, columnar cactus, a clustering euphorbia, and star-shaped Agave lophantha ‘Quadricolor’. Find more ideas in my book, Succulent Container Gardens. 10. Showcase the symmetry of succulents. Small agaves look great in pots that frame and call attention to their elegant, geometric shapes. Here, Agave victoria-reginae graces a hexagonal pot near Nancy’s front door. 11. Include a dry creek bed. In a drought-prone climate it’s soothing to suggest the presence of water. To create the look of rushing water, designer Michael Buckner lined Nancy’s dry creek bed with cobbles turned sideways. Such enhancements can channel water from gutters into the garden and provide access to hard-to-reach areas. See the section in Designing with Succulents on dry creek beds, pp. 56-59. Nancy Dalton’s s garden won the city of San Diego’s drought tolerant landscaping contest and was on the San Diego Horticultural Society’s Spring Garden Tour. Located in Carmel Valley, the garden has a mild, frost-free climate. Landscape designers Samantha Owens of Barrels and Branches nursery and Michael Buckner of Deeter-Buckner Design helped with soil amendments, plant selection, placement, and installation. Nancy herself is knowledgeable about plants and is a hand’s-on gardener. 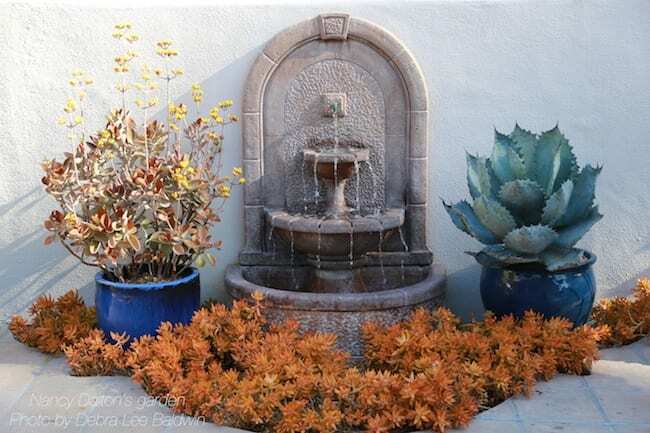 Download my list of Succulents for Coastal Southern California Gardens. See Nancy’s garden in my video, Design Ideas from an Award-Winning Succulent Garden. …and in my book, Designing with Succulents.